If you're like me and my family, you've probably waited until the last minute to figure out what you're making for Easter dinner. And in true fashion, this post is a little later than I would have liked to share with you guys. Hopefully you're like me and haven't given two thoughts to your Easter dinner yet. Do you want to do something a little different or do you stick to the classic family recipes? Last year I celebrated Easter with my Aunt and Uncle for the first time. I hosted my very first Easter dinner with all the fixings my family traditionally has. I was really proud of myself. Everything went without a flaw (I got lucky). I was really happy I got to share a bit of my Seattle family traditions with my Chicago family. I was able to introduce my Uncle to ham gravy - something he had never thought of before. 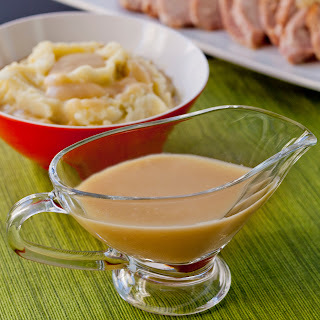 Something I couldn't imagine ham dinner without… seriously, HAM GRAVY. Do I need to say more? Is it just my family that makes this or is it something you've heard of before?! Either way, I feel it is my duty to share this salty, meaty, porky goodness with you all. If you haven't had it, make sure you include it in your Easter menu this year. You can thank me later. If you're all about a glazed ham, not to worry. 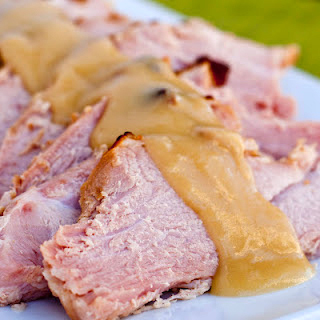 I've taken it upon myself to figure out how to get ham gravy goodness without sacrificing your beloved glaze. Check out the improv style section below the recipe for all of the different options you have. And if you're looking for a tasty glaze that's not bourbon brown sugar, maybe try my fig mustard glaze. Fig + Ham were a match made in heaven in my book. This year, Easter dinner is at my Aunt and Uncle's house. I can't wait to see what their family meal traditions are! I know what they do with their ham leftovers and I can't wait to share that with you guys! My Uncle blew my mind last year when he suggested it… GENIUS and yet so simple! What are some of your Easter or Passover traditions? Preheat oven to 325º. Take a big knife to your ham hock and gash it a few times in the bone. This will help release the flavors. In an oven safe dish, combine ham hock with water or stock (I use my 9x9 glass pyrex). You don't have to measure perfectly how much liquid you put. Just fill the dish as much as you can with water and cover up the ham hock at least half way. I usually use a box of chicken stock and then fill the rest up with water. I know chicken isn't pork but I find it helps add to the depth of flavor in the gravy. It also gives it a nice brown color. Heat in the oven for at least 2-3 hours so that the ham flavors get in the liquid. Strain liquid into a bowl and let cool. You can do this up to 3 days before you want to serve. Depending on the amount of liquid you yielded and the consistency you like, the next steps vary. For me, I like a gravy that isn't runny but isn't a thick, gelatinous lump either. 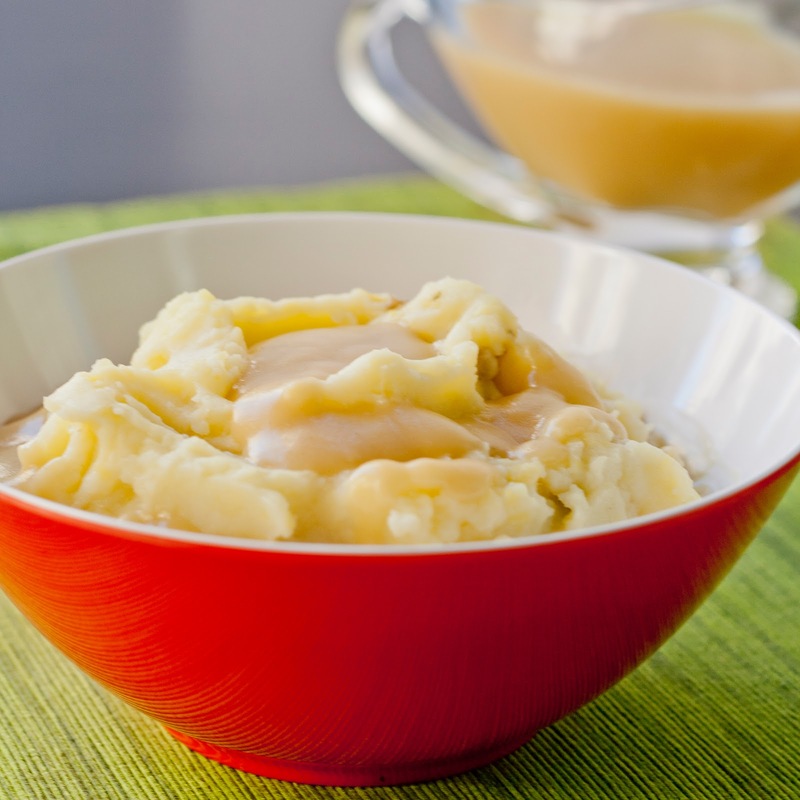 For thinner gravy, add more liquid or less flour. For thicker gravy, add more flour or less liquid. In a medium sized pot, melt your butter with flour and stir until it forms a paste. Pour your stock over the roux (flour + butter mixture) and whisk like a crazy person until it's incorporated. Gently simmer for about 15 minutes until mixture is thickened. If you find your gravy too runny, you can always mix some flour with a little bit of water (you want to dissolve it best you can) and slowly stir a little at a time into the pot and wait 5 minutes to see how it thickens up. If your gravy is too thick, you could add a little more stock if you have it or chicken/veggie stock OR a little water if you must. 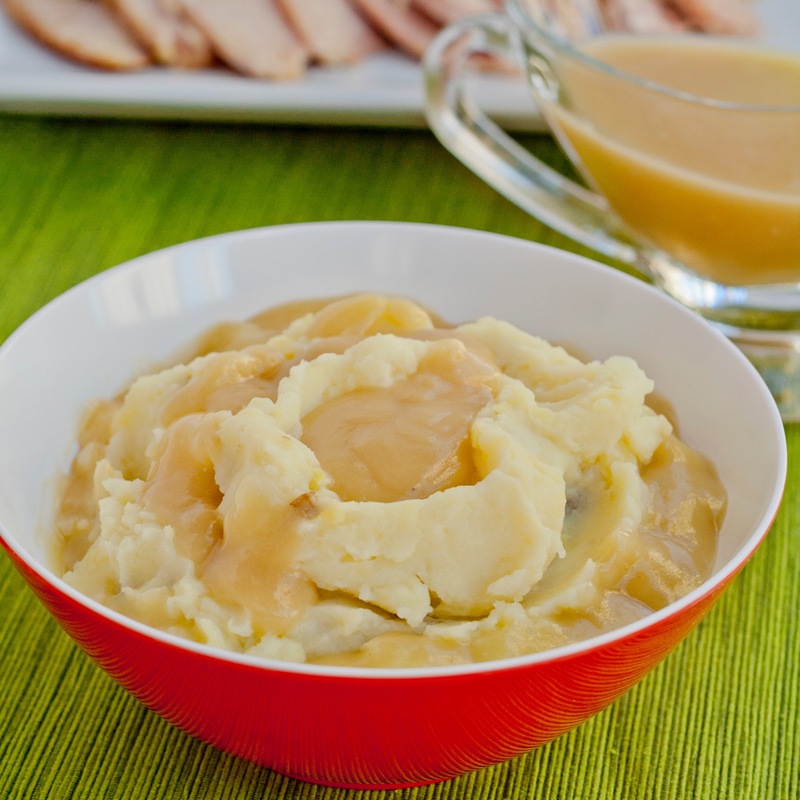 If your gravy turns out lumpy, never fear. You can put it in a blender or use a hand blender to incorporate all of those little lumps. this is a basic ham gravy. i like a strong ham flavor but if you want to make it a little fancy, you could add some herbs (thyme, rosemary) or booze (sherry, bourbon, or a little white wine). whatever you like to do to your turkey gravy would make sense here for the most part. you could add some veggies like carrots, celery, onion and garlic to the pan with the ham hock as you cook it to add more flavor. maybe i'll try that next time i make it. gluten free? NO PROBLEM! use cornstarch instead of flour. Just make sure you mix it well with a bit of the cold stock or water. You want to turn it into a slurry (a thin paste) to drizzle into your hot stock. You can always add more so be light handed at first! it will thicken after about 7 minutes and you'll know if you need to add more or less. don't want to buy a ham hock or can't find one at your store?! no problem. pour some water and chicken stock in the bottom of the pan you cook your ham in. baste it every 30 minutes with the juice to maximize the ham flavor in your broth. 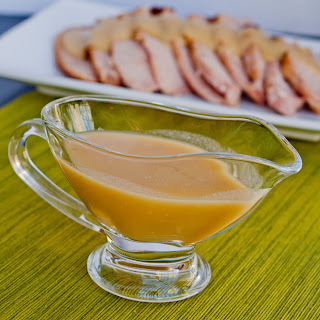 you won't want to glaze your ham unless you want a sweet gravy or your gravy to taste similar to your glaze. i've found sweet gravy = gross. 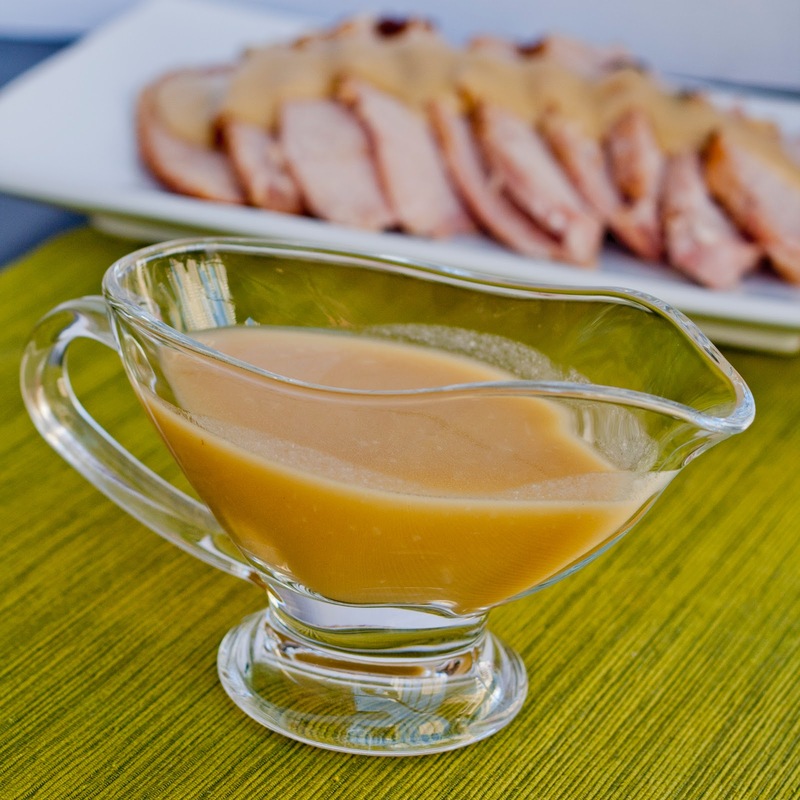 while your ham is resting, make your gravy. Can't wait to try this for Easter. We're serving a honey baked ham. Thank you! I hope you love it Robbyn! !